A huge thank you to Andrea McDonald for this guest post about her family's visit to the Liberty Science Center, and also a huge thank you to Liberty Science Center for providing admission tickets, as well as tickets to giveaway. This past President’s Day weekend, looking for something fun to do in the subzero temperatures, my family and my sister’s family decided to go to the Liberty Science Center with our four kids ranging in age from 4 to 9. We were excited for the Science, Sabers and Star Wars: The Force Awakens event that was taking place just for the weekend. However, we arrived to find that what seemed like literally thousands of others were just as excited about that, and the Star Wars event was incredibly crowded with long lines. So we quickly decided instead to check out some of the many other exhibits currently at the Science Center. We first found our way to the Sid the Science Kid: The Super-Duper Exhibit which runs through May 15, 2016 and is included with general admission tickets. 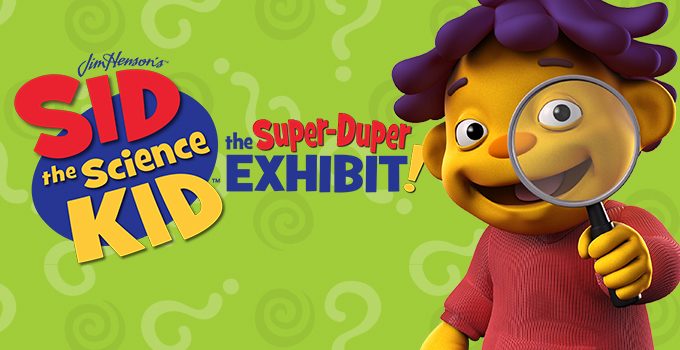 This exhibit allows young learners to explore STEM activities through a variety of activities like: Catapulting Sid’s toys into his toy box using a lever, testing inertia using toys on a skateboard, experimenting with friction and testing different surfaces and designing their own “Super-Duper-Ooper Big Idea. We knew our 4 year old would have fun, as he really likes Sid the Science Kid, but weren’t sure our 7 year olds or 9 year old would be engaged by it. We didn’t need to worry. All the kids loved it. Our 4 year old son could have spent all day playing with the ball machine (for lack of the technical term), using the pulleys to bring the balls up to his 9 year old cousin waiting on the top part of the structure and then catching them when they fell and trying to determine which ball would land first if two were thrown down at the same time. My daughter really enjoyed using the microscope to look at objects focused in different ways and at varying sizes. After we managed to drag the kids out of the Side the Science Kid Exhibit, we went to Titanic: The Artifact Exhibition around the corner. Tickets are required for this exhibition - $27.75 for adults, $22.75 for children 2-12 and $24.75 for seniors. The additional cost is well worth it for the history buffs among us. In it, more than 130 legendary artifacts conserved from the ships debris field are showcased. As we entered, we each received a replica boarding pass of an actual passenger aboard the Titanic. And we moved through the life of the ship, from its construction, to life on board, to the ill-fated sinking and amazing artifact rescue efforts. 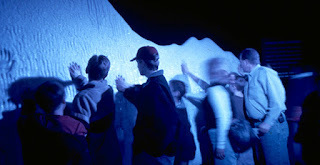 The adults really enjoyed seeing the many artifacts, while the kids especially liked seeing the re-created first and third class cabins and touching the iceberg. The “Memorial Gallery” where we could take our boarding passes to learn whether our passenger and traveling companions survived or died was interesting to adults and children alike. In addition to the special exhibitions, we also visited more permanent exhibits such as Our Hudson Home, which explores our complex relationship with the distinct and special Hudson River ecosystem. Our girls had a great time donning lab coats and conducting an experiment in ecology. All in all, we spent a great day at the Liberty Science Center, and had so much fun at the many other exhibits that we didn’t even regret not making it to the Star Wars exhibit. Especially after we ran into a storm trooper on our way out and managed to get our picture taken with him. WIN A FAMILY FOUR-PACK OF TICKETS TO THE LIBERTY SCIENCE CENTER! Liberty Science Center is offering a family prize pack of four tickets to visit the museum! I missed the Tesla Show the last time I visited, so I'd really like to see that. But the Hudson River exhibit is always a favorite. I think Maya (age 4) would like the Infinity Climber best, but if I win O'd probably give the tickets tour friends who live in Teaneck and their 4 kids (2,3, 6, and 7)--I'm sure there's something each kid would love! Giveaway was just terrific. It sounds like your visit to this event was great. I wish I could attend such fun events at our local event venues. I don’t know but whenever they are organized, I always get quite busy and miss attending them.